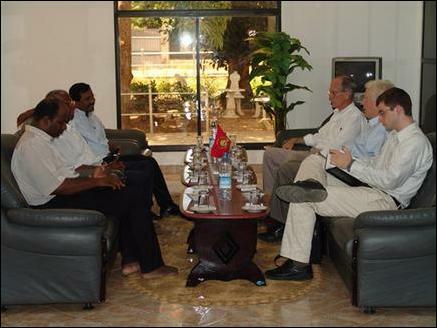 In a meeting with Forum of Federations, Canada, the LTTE's Political Head Mr. S. P. Thamilchelvan Friday told that institutionalising ISGA will ''prevent secession and pave the way for unity and lasting peace,'' according to sources at the LTTE Peace secretariat. The Honourable Bob Rae, Chair and President of Forum of Federations and Former Premier of Ontario, and Professor David Cameron, University of Toronto, Department of Political Science and member of the Boad of Directors of Forum of Federations visited Kilinochchi Friday and held discussions with LTTE's Political Head. ''LTTE, conscious of its moral responsibility as an organization that spearheaded the freedom struggle, has submitted the ISGA proposals with a view to first address the urgent humanitarian needs of the people in the war-torn NorthEast, win their confidence, and make them real stake holders in the peace process that would usher lasting peace in their life,'' Mr Thamilchelvan told the Forum of Federation representatives, LTTE Peace Secretariat said. Forum of Federations representatives also met with Fr. M.X. Karunaratnam, chairperson of NorthEast Secretariat on Human Rights (NESOHR) in Kilinochchi Friday. Fr. M. X. Karunaratnam briefed Forum of Federations representatives on the activities of the newly established NESOHR. The Forum of Federations is an international network on federalism that brings together practitioners, scholars, and youth to learn and share ideas and experiences. It is based in Ottawa, Canda. The non-profit orgnisation engages in programs of mutual cooperation designed to help develop best practices in countries with federal systems of government around the world. The Forum works also with countries that are exploring the possibilities of a federal political system. Bob Rae served as Ontario’s 21st Premier, and was elected eight times to federal and provincial parliaments before his retirement from politics in 1996. He is the author of two books, ''From Protest to Power'' and ''The Three Questions''.